AAI's International Programs Coordinator, Andy Bourne, decided to take his late summer vacation to the Eastern Sierra in September. 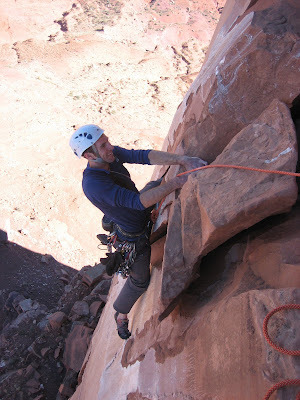 He and local goofball Josh Wonner had a big ticklist they wanted to complete. Although they managed to get up a couple of Sierra alpine classics, the weather moved in after a couple of days and "forced" them to concentrate their efforts on the noble pursuit of bouldering and soaking in hot springs. It's a tough life indeed. We started out climbing Mt. Conness (12,590'), which has 3 main ridges to choose from. 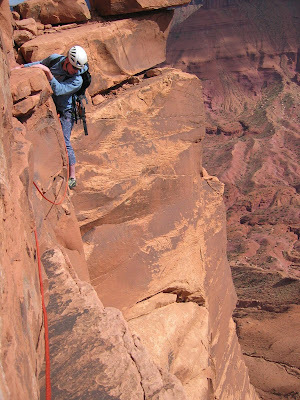 The East Ridge is the easiest, the North Ridge clocks in at Grade III 5.6, and the West Ridge is rated about the same as the North. Oddly enough, we decided to take the class 2 East Ridge for the ascent and then downclimbed the 5th class North Ridge for the descent. Meadows, and the West Ridge and Southwest Face of Conness. 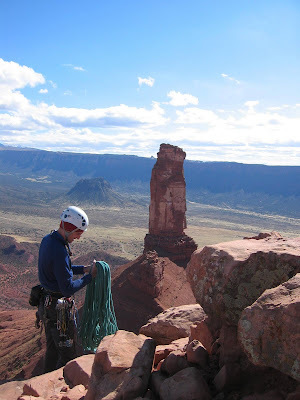 Scrambling up the East Ridge. On the summit looking down our descent of the North Ridge. 5.6 downclimbing is great fun! waves of the upper North Ridge. And a foreshortened view of the entire North Ridge, almost a mile long. Next up was the famed 3rd Pillar of Dana. 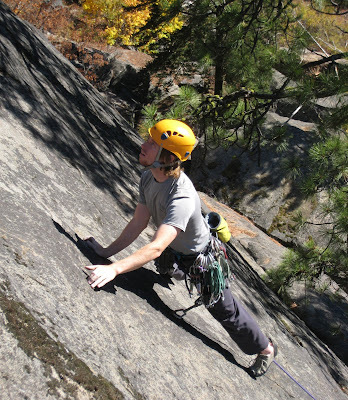 Rated at 5.10b, this 5 pitch climb ascends some of the most amazing granite this side of the Bugaboos. up Glacier Canyon, past Mt. Dana. The Dana Plateau lives up to it's name. Here Andy wonders if they are going the right way. 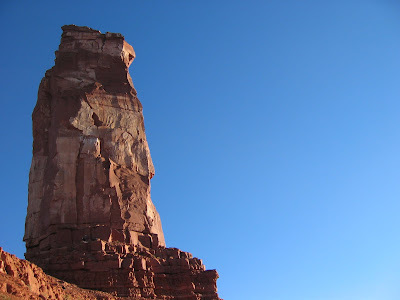 The Dana Plateau abruptly drops off, forming the 3rd Pillar. route is a classic. It’s also a bit intimidating. an insecure, flaring finger crack. splits a series of roofs.
. . . And the reward - hot springs! The hot springs of the Owens River valley, a climber's paradise. To speak with someone about booking a trip in the Sierra for this winter (mountaineering courses, ice climbing, skiing) or for the summer 2008, please email us at info@aai.cc or give us a call at 360-671-1505. It's never too early to start planning for next year! Castleton Tower (tower at center) and the Rectory (in left-hand background). Fine Jade from the North Face of Castleton. The beautiful route, Fine Jade. Nate on Fine Jade's airy traverse on pitch 3.
the North Face of Castleton, in the background. The North Face of Castleton Tower at sunset. for 20 feet or so. It was amazing. 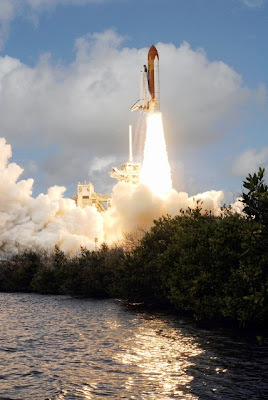 Discovery STS-120 launches into space. 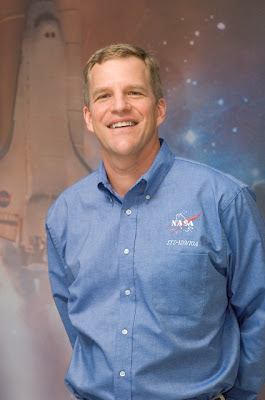 Dr. Scott Parazynski, who was a member of a 2006 American Alpine Institute Denali Expedition, is now serving as a mission specialist aboard the Discovery Shuttle (STS-120), currently in space and bound for the International Space Station. STS-120 is the 23rd shuttle mission to the International Space Station, and will launch an Italian-built U.S. multi-port module for the station. Scott Parazynski during a training. Scott is the crew’s chief spacewalker and outdoor repairman. 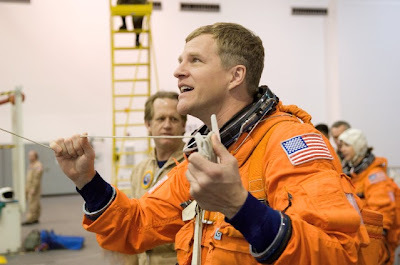 A doctor as well as an instrument-rated pilot, Scott practiced for this mission by patching deliberately damaged shuttle tiles in a first-ever space demo of a high-tech caulking gun and goo. This will be his fifth spaceflight. 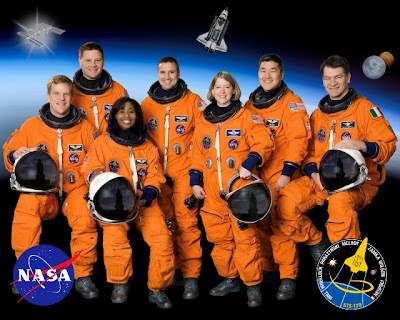 Discovery STS-120 crew, with Scott on the far left. The mission is led by retired Air Force Col. Pamela Melroy, the second woman to command a shuttle flight. For more about her and the other astronauts, check out the MSNBC article: http://www.msnbc.msn.com/id/21382916/from/ET/. Another shot of the shuttle lifting from Earth. 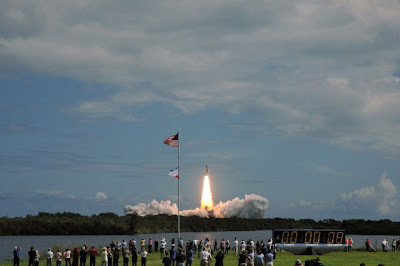 Here is a link to NASA's page covering the Discovery STS-120 mission: http://www.nasa.gov/mission_pages/shuttle/main/index.html. Centenial Hut at the Head of the Franz Joseph Glacier. Tasman Sea in the distance. I returned to New Zealand in July for the winter season. 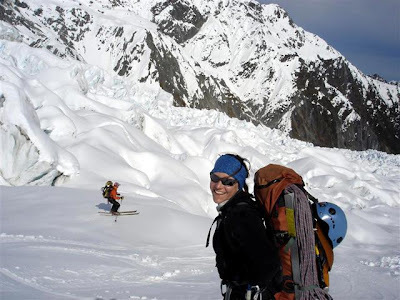 My first task was transferring my snowshoe fitness from guiding Denali to ski fitness for my final ski guides exam. I had a week to organize myself and get out on skis a couple of times with my Wanaka housemates. 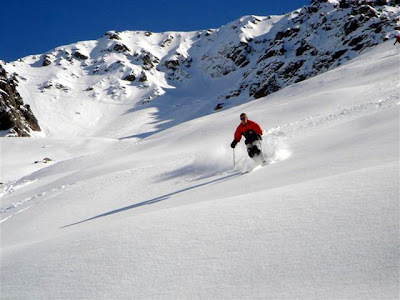 Late July I moved to Methven to work with Methven Heli Ski. My first two weeks were guiding the Burton Film Crew. They came to ride and “huck” off things in our terrain for a month. Unfortunately, (because of what I described above) we had a snowpack that had a persistent weak layer that was deep and reactive. The only safe areas had already avalanched or were nearly flat and far away from anything above you. Nearly daily we set off remote avalanches - we would be on a ridge or safe flat spot and feel or hear a settlement, then we would see an adjacent slope slide. Burton snowboarder jumping filmed from a helicopter. July and August were very dry, so it took over 3 weeks to get enough snow to cause natural avalanches to flush out our weak layers. 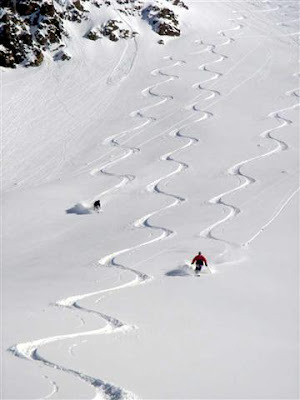 Finally we could ski all of the runs which had slid and we had great coverage on top. I had some brilliant days with return clients and friends. Mark, Eric, and Lex on Superbowl. We get much more snow than the New Zealand ski areas, since we are closer to the main divide and are at higher elevations. 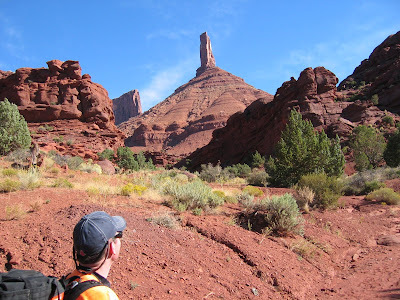 We have three large mountain ranges to choose our runs from. Unfortunately, when the ski areas have poor snow we have less people interested in skiing in general, so in late September I returned to Wanaka. A three-day fine weather spell gave my household a chance to climb Mt. Douglas at the head of the Fox Glacier. It is a short jaunt from Pioneer Hut. Nick and Anthea went up the left line and Stu and I the right. Both are classic NZ grade 5 alpine routes. 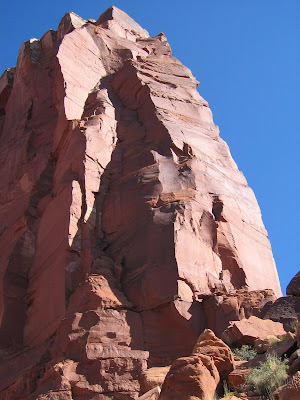 Stu and I soloed and then climbed together until the slightly above mid height. Nick and Anthea joined into our line on the upper face. Ski conditions were great for a quick ski down the Fox and a flight out from Chancellor Hut. Anthea and I skiing Fox Glaicer from Pioneer to Chancellor Hut. A day later, I was teaching an avalanche course and climbing in Arthurs Pass. 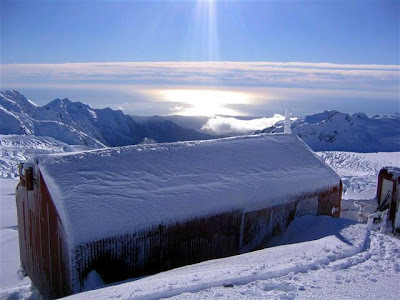 It is another amazing New Zealand mountain location. You either want to be fit when you get there or will need to adapt quickly. The shorter climbs are about 1300 m of vertical. On a perfect weather day we did the Phillistine Rolleston traverse - about 13 km and 1600 m of vertical on some spectacular ridges. Philistine Rolleston Traverse in Arthurs Pass. As this winter wraps up, New Zealand has entered into a more typical weather pattern of disturbed westerly flow. Over 5 m of snow have fallen around the main divide this week, which is a welcome top-up for our glacier before the summer season. I am off to Tasmania (where they are forecasting highland snow) and Thailand (no snow!) and will return to New Zealand again in November to continue to play in the hills here until the end of February. 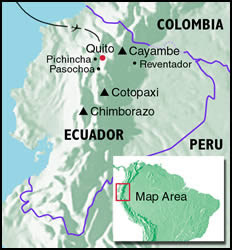 AAI's new route on Chimborazo, highlighted in red. Almost all ascents of Ecuador's 20,703-foot Chimborazo have been done by one of four routes on the mountain's southeast side, all of which are now dangerously out of shape and subject to severe rockfall. 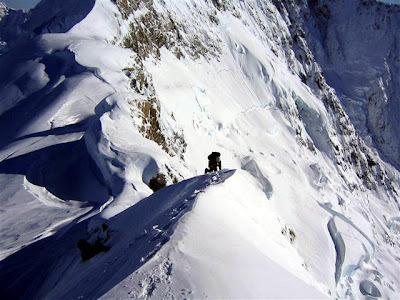 Last spring, we successfully scouted a new route on the north side of the mountain that will provide us with a much safer route to the summit. 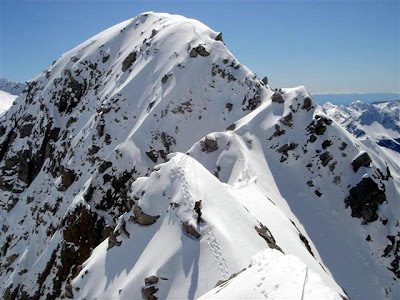 It also has the advantage of ending on the main summit, Whymper Peak (20,703'), and avoiding the soft snow traverse across the vast, 20,000-foot summit plateau from Ventimilla Peak (20,539') where the other routes culminate. 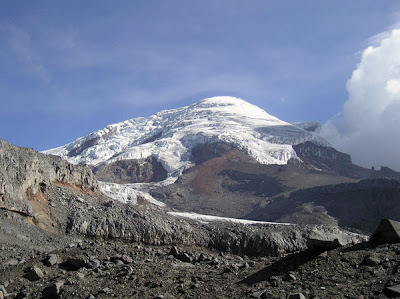 A closer look at Chimborazo's north face. Our new north face route is very aesthetic: it offers high quality snow and ice climbing and a wilderness experience. We'll be using horses to carry our gear to base camp, which adds to the sense of remoteness and adventure. 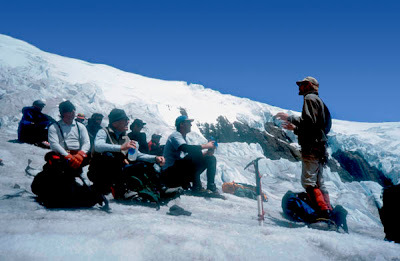 Climbers receiving instruction on Chimborazo's flanks. For more information, please visit our Ecuador High Altitude Expedition website. 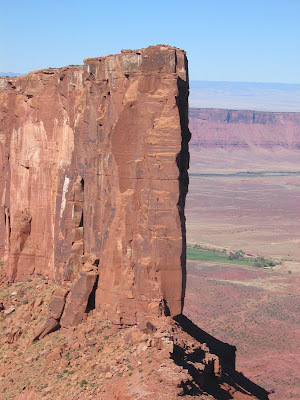 No previous climbing experience necessary for this expedition. You can also email or call our International Programs Coordinator, Andy Bourne, at abourne@aai.cc or at 800-242-2249.